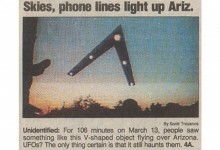 On March 13th 1997 a very large number of unidentifiable flying objects were spotted in Arizona. They were arranged in a very orderly fashion, seemed to be orbiting or flying at very low speeds one next to another. The shapes were globular and many of the people who admitted to seeing them had similar stories to tell about these anomalous lights. What was initially considered to be a few meteorological balloons one next to another, soon began to multiply, again, in a very orderly fashion, leaving many to wonder if this was a man made prank, some very weird meteorological event or a genuine UFO massive sighting. One very interesting way in which the lights were interpreted saw them as the engines of a massive ship in orbit around the globe. Thus, the lights were not coming from independent ships but instead from a single massive ship, whose purpose and mission was unidentified. From a top secret government program to actual alien ships that were documented and have been seen even from far back as the Mayan period, the lights have stirred the imagination of many people and are still under scrutiny, as a definitive answer to these questions is yet to have been arrived at. What is undeniably true about the case is that there were a few different video materials caught by different amateur video cameras showing clear images of the yellowish lights, from multiple angles. The people that have showed the materials did not know each other or collaborate to produce the footage and the different angles were enough to certify that the materials hadn’t been tampered with. As such, the mystery still remains and whether it will prove to be an experimental craft from the government or the source will remain unidentified, the truth remains to be elucidated. Are there aliens watching us? AS ASTRONOMERS scan the universe for signs of intelligent life, a group of researchers predicts other beings just might be looking at us. A scientific paper published in this week's online edition of Astrophysical Journal suggests alien astronomers armed .